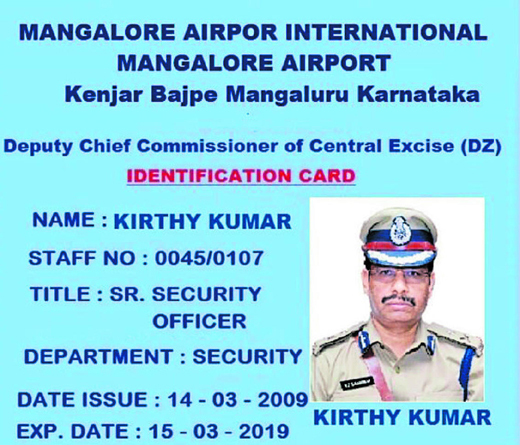 Mangaluru, July 03, 2018: A fraudster posing as “Deputy Chief Commissioner of Central Excise” Kirthy Kumar with an ID card issued by Mangalore International Airport has cheated over a dozen people through OLX and each person has lost over Rs 2 lakh. However, no one has filed any complaint in this regard. The modus operandi of “Deputy Chief Commissioner of Central Excise” is to place an advertisement on OLX that he would like to sell his car, a Swift and buyers can pay only Rs 50,000 to Rs 1 Lakh in advance and the balance amount after the car documents are transferred. Most of the potential customers fall for the trap as the car belongs to senior IPS officer and is on sale for a low price because he (Deputy Chief Commissioner of Central Excise) has been transferred to North India and would like to dispose of his car before he leaves Mangaluru. “In the past six months, over 12 people paid anywhere between Rs 20,000 to Rs 2 lakh online, and arrived at the airport to collect the car,” said a source at the airport. A few even got into a quarrel with the airport staff and call the fraudster saying that the airport authorities are not handing over the car. In fact, the fraudster picks the call with a promise to return the call and later switches off his phone. “We are fed up after convincing the buyers that they have been cheated,” said the source and added that none of them have filed any complaint with the police so far, despite our plea that they approach the police, to avoid further cases of fraudulence. Once the buyers come to know that they have been cheated, they return, perhaps out of shame or to avoid running after police station. “By now the “Deputy Chief Commissioner of Central Excise” would have swindled some lakhs,” said another staff in the airport. When contacted, Central Excise Commissioner Dr Subramaniam said that there is no such rank as Deputy Chief Commissioner of Central Excise. In Central Excise Department and the role of security at the airport is looked after by CISF and not Central Excise. Airport Director V V Rao said that he is aware of the issue and even advised the victims to lodge complaint with the police. Loopholes in ID : There are errors in the ID and a careful check would reveal that the ID card is a fake. To begin with, the word airport is wrongly spelt in the ID. Secondly, there is no seal of Airports Authority of India (instead GMR logo is there, which is that of Bangalore airport and not Mangaluru) or hologram, which is common in IDs. Most importantly, the Mangalore International Airport does not issue any ID to any officer, said a staff belonging to the airport.